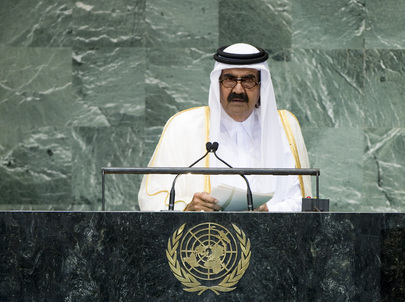 SHEIKH HAMAD BIN KHALIFA AL-THANI, Amir of Qatar, said that the Arab world was currently weathering a period that was “difficult and risky” and at the same time offered the prospects of hope. Indeed, the current tremors were an impressive attempt to correct prevailing conditions in the region at a time when the entire world was changing rapidly. The unprecedented Arab experience was proving vastly different from previous transitions that had occurred elsewhere, and even if from afar the conditions seemed troubling or “filled with flames and smoke”, he assured delegations that what they were hearing and seeing was in fact a region struggling to cope with the times and overcome obstacles that had hampered its march forward. The region was, at last, taking matters into its own hands after having suffered years of dictatorship, dependence and corruption. Recalling that the American political and social experience had risen from the ashes of civil war, and that Europe had gone through terrible world wars before achieving a degree of unity that could not be attained by arms or hegemony, he said that the events in the Arab region were “natural and historic”. He said that people could not attain freedom by merely asking for it and history was replete with examples of people risking their lives and wealth for liberty. At the same time, it required resistance to depose dictators and hard work to overcome backwardness. Further, occupied territories could never be restored simply by merely rejecting occupation. It required persistence in demanding rights and resistance through all legitimate means. What made the situation so unique in his region was that Arabs and Muslims had high aspirations and that the changes were occurring “under the spotlights […] and satellites” and under the influence of electronic media without any barriers. Along with others in the region and beyond, Qatar had recognized the risk of the current events in the Arab world. “If we would ask for something in this session, it would be the renewed encouragement that confirms the rights of our Arab world to continue its advancement and achieve its aspirations in a new world influenced by science and technology,” that the pioneers that had written our well-known conventions on rights and freedoms could never have foreseen. At the same time, he hoped that delegations gathered for the general debate would sympathize with the historical transformations under way in the Arab world. That would reassure peoples who were marching with determination towards “a place fit for them in history” with the hope of a better tomorrow for future generations. Turning to the “unacceptable” situation in Syria, he said that hundreds of people were being killed every day under fire from a regime that did not hesitate to use weapons against its citizens. All international efforts, including by the Security Council, had failed to pull Syria out of the current cycle of violence, so he believed it was better for “Arab countries themselves to interfere, out of the national, humanitarian, political and military duties” to the region, and to do what was necessary to stop the bloodshed in Syria.